Welcome November! The weather here around Boston is starting to cool down, dusk arrives noticeably sooner and so it’s time for cozy, spice breads. 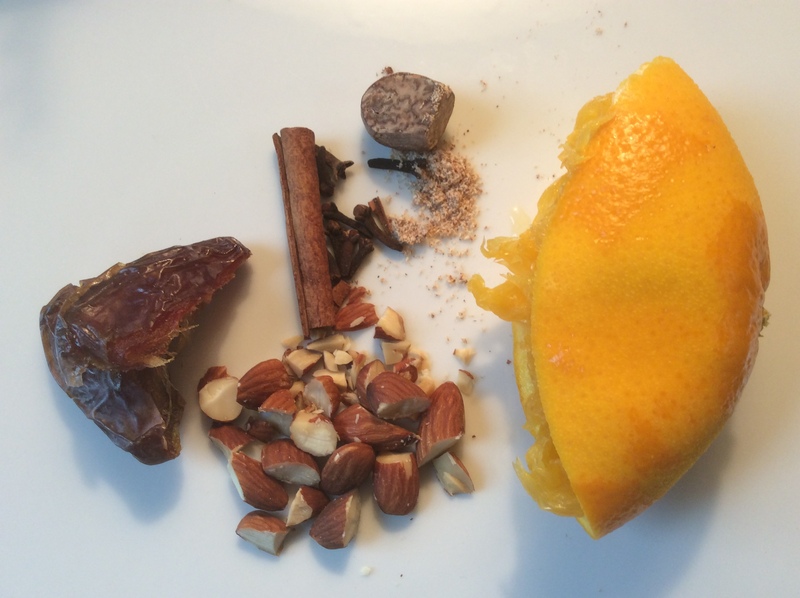 This one is jam-packed with marinated dates, almonds, cinnamon, nutmeg, cloves and lots of orange, making it wonderfully fragrant and perfectly seasonal. 1. Preheat oven to 350F. Butter bottom of 8 1/2 x 4 1/2 x 2 1/2 inch loaf pan. Line the bottom with parchment paper, then spray or butter and flour the pan. 2. Pit dates if they are not yet, chop and combine with orange liqueur in a small bowl and set aside for 20-30minutes. Stir occasionally. 3. In a large bowl with wooden spoon (or in electric mixing bowl), combine butter and brown sugar for one minute. Scrape down the bowl. Add the egg, vanilla, and zest, stir carefully but do not over mix. Sift together flour, baking powder, baking soda, cinnamon, nutmeg, cloves and salt. Stirring carefully (or with mixer on low), add the flour mixture alternately with the orange juice to the butter & sugar mixture, mixing only until combined. By hand, stir in the dates with their liquid, and the nuts. 4. Pour the batter into the prepared loaf pan and smooth the top. Bake for 50-60 minutes, until a toothpick comes out clean. Cool in the pan for 10 minutes, then turn onto a wire rack and cool completely. Storage: Wrap or cover in plastic wrap and refrigerate for up to a week. I love when a soup like this comes together! I found myself with a handful of sweet potatoes and a few juicy Bartlett pears, both which needed action before being past their prime. 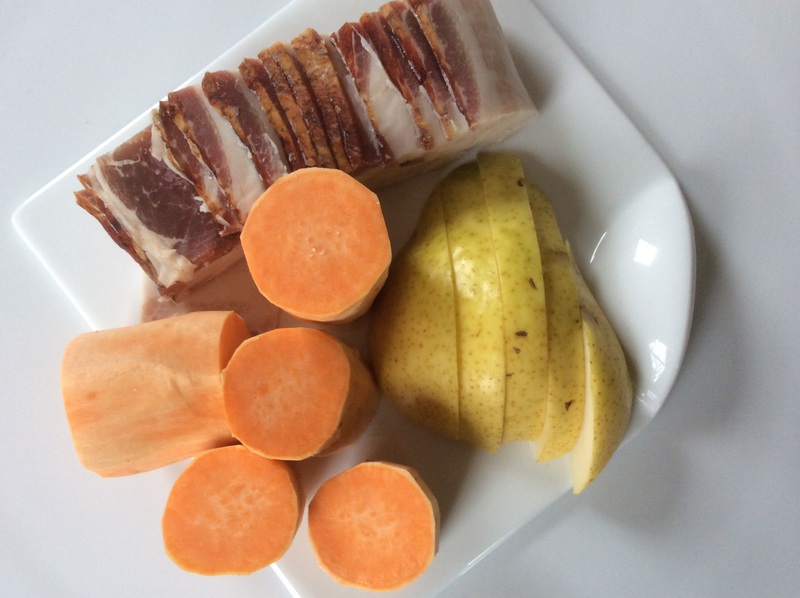 When I discovered a recipe for a sweet potato, pear & bacon soup, I happily plucked some bacon from my freezer and got right to work! Then to the softened shredded vegetables and fruit, add allspice, cayenne, stock or water, and cream and let it bubble away for a quick 10 or 15 minutes. Once the squash is tender, whirr the immersion blender to carefully puree. 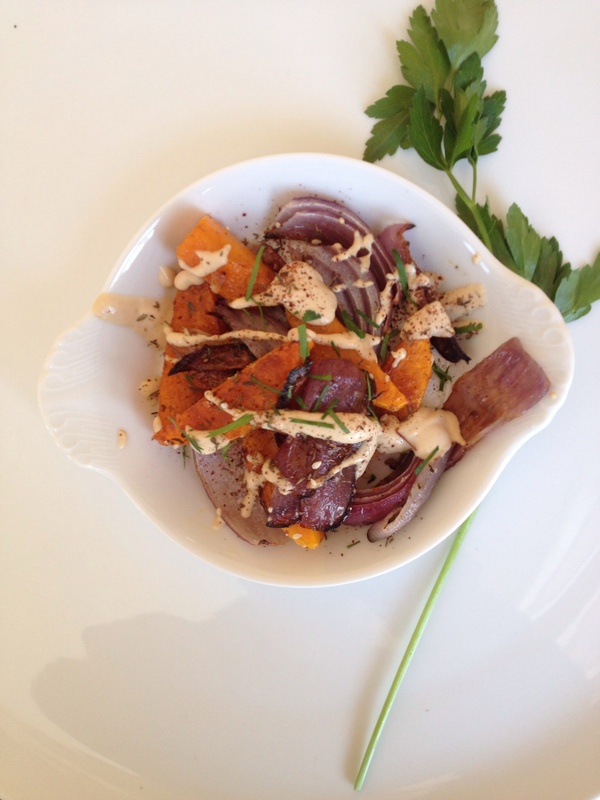 Taste for seasonings – it should be a lovely mix of earthy sweet potato, fruity pear, a little smoky, with the perfect amount of kick from the cayenne. Garnish with the crunchy bacon and you will be one happy camper. Here’s to surprise victories while cleaning out the extras! Chop 8 slices bacon into 1-inch pieces. Add bacon to large pot over medium heat. Cook, stirring occasionally, until crisp, 5-10 minutes. Peel & trim sweet potatoes, cut into small pieces to feed into food processor. Trim, peel & quarter the onion. 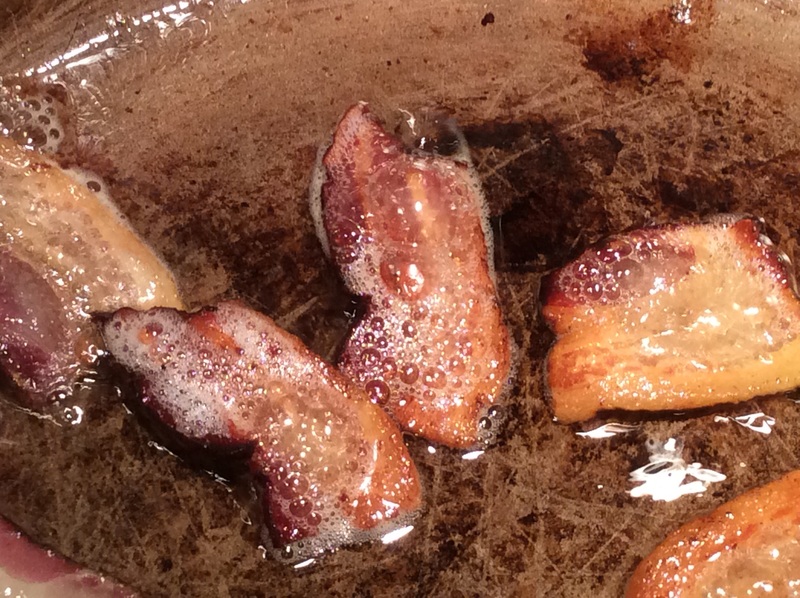 When bacon is crisp, transfer it to paper towel lined plate with a slotted spoon. Turn heat to low. Shred vegetables & fruit in food processor with grating disk; empty work bowl into pot as it fills. Raise heat to medium-high; add 1t allspice, 1/4t cayenne, sprinkle of salt & pepper. Cook, stirring, until spices are fragrant, about one minute. Add five cups stock or water and one cup cream. Bring to a boil, reduce heat so that it bubbles gently but steadily. Cook until squash is fully tender, 10-15 minutes. Turn off heat and run an immersion blender through the pot, or working in batches transfer it to an upright blender and carefully puree. Reheat the soup for one or two minutes if necessary. Taste and adjust seasoning. 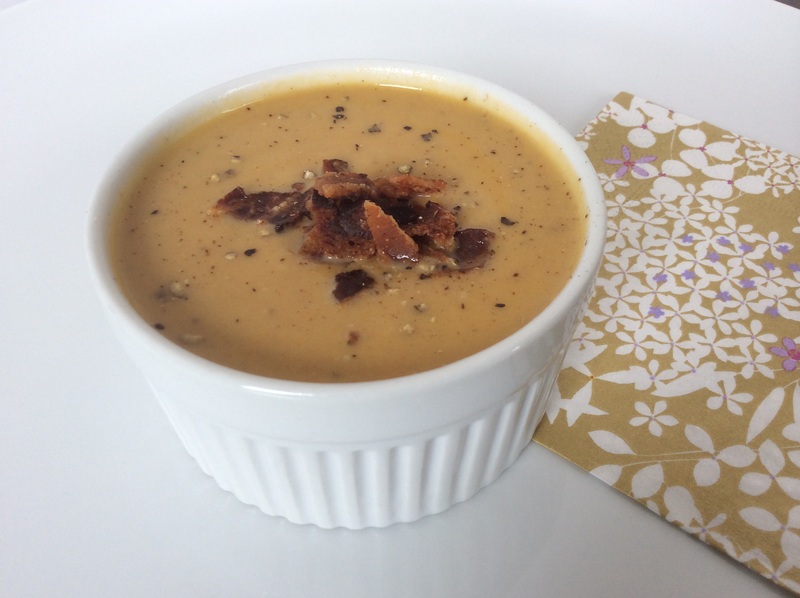 Divide soup among four bowls, garnish with bacon and serve. This ‘cake’ is a marvel of baking chemistry. Pain d’Epices (which translates to ‘spice bread’) has a roughly 450 year old rich history in France, resulting in countless variations. Dorie Greenspan’s latest book ‘Baking Chez Moi’ has a version that suddenly moved me to action. 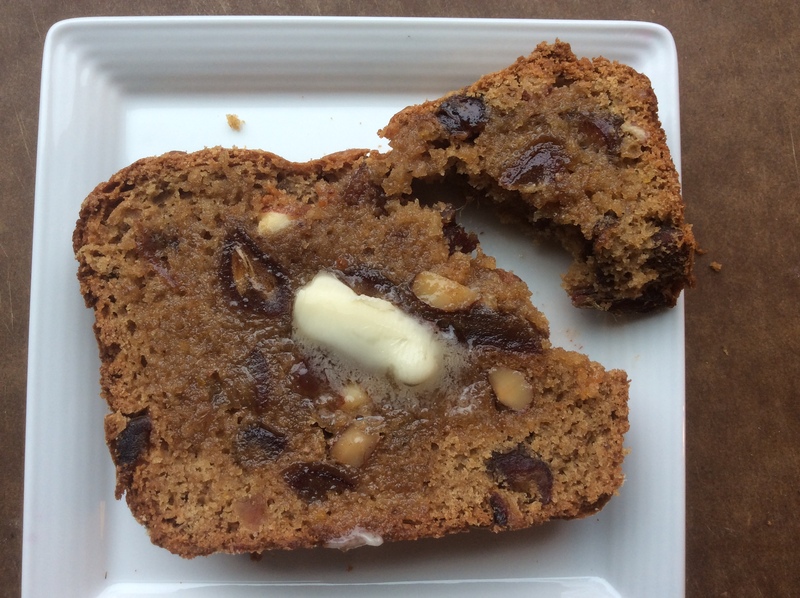 Think of a teacake or loaf cake, and historically, one that relies primarily on only honey for sweetness, a varying list of spices and no eggs. Even more interesting, Master Greenspan instructed to wrap the cake well and leave on the counter for a few days to ‘ripen’, as this cake is best aged. I was intrigued. 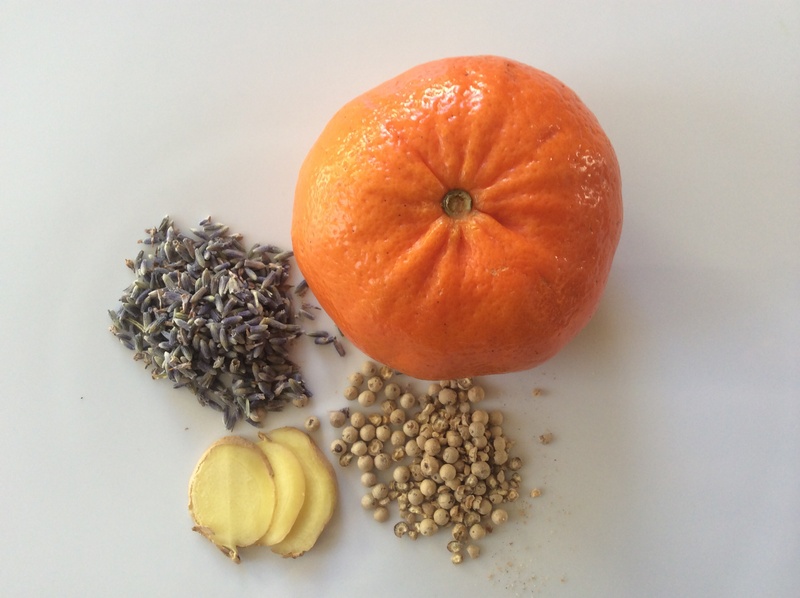 When her opening ingredients included orange, peppercorns, fresh ginger and lavender to steep together to be added to the dough, it was officially time for me to make my first one. After steeping these ingredients in water, you strain them and, to this uber-fragrant infusion, stir in melted butter and honey. In a different bowl, you grate citrus zest over the sugar and rub them together and this is added to the flour and baking powder. You then mix wet and dry ingredients, finally stirring in dried cherries and placing into loaf pan. But the real magic is the ‘ripening’. The cake is perfectly acceptable soon out of the oven as a tea cake for dunking, but after two days, the flavors are layered, you taste the honey, then the lavender, then the ginger, and by five days after, suddenly the texture too has changed, shifting from a crumbly cake for dunking to a soft, doughy bread with great flavor depth. I love the concept of a cake being at its best days after the baking itself, and I wish I had another slice right now. Bundle up everyone (cakes included). Here is a perfect summer mushroom plate. It is light & healthy and travels very well for lunch al fresco. 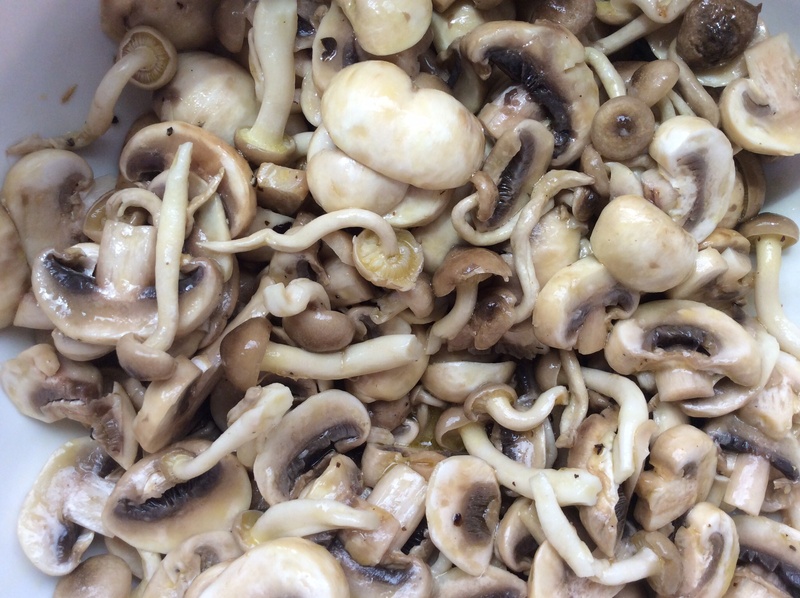 It starts with a tangy marinade of olive oil, white wine vinegar, maple syrup and lemons whisked and poured over a mix of button mushrooms and beech (or shimeji) mushrooms. 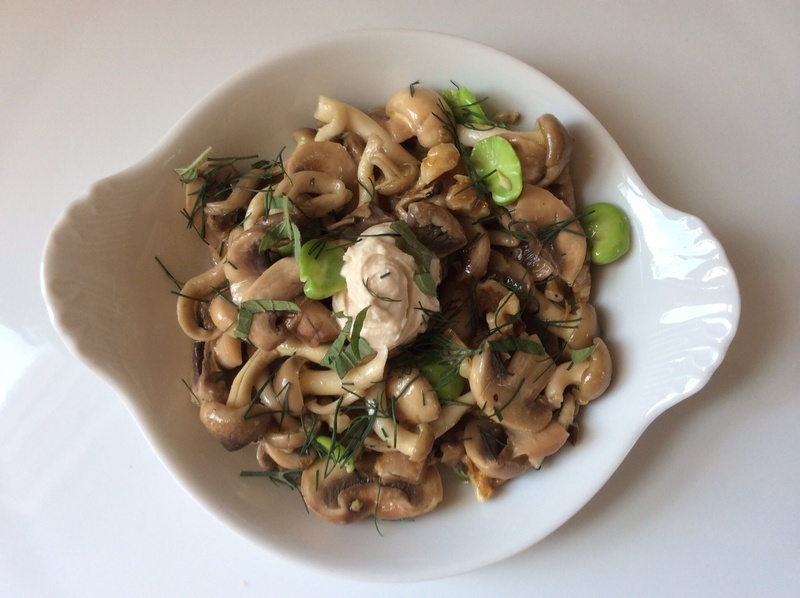 I love the use of white button mushrooms here, since their simplicity is often over looked. 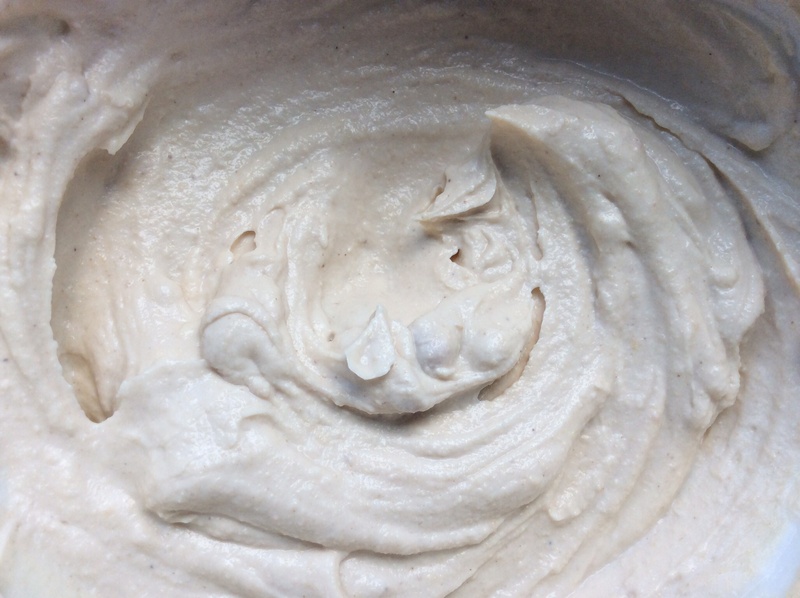 Whip up a tahini yogurt with greek yogurt, tahini paste, and garlic and set it aside. Finally, give a quick boil to some bright fava beans (skin them if you like afterwards, which I do), chop some walnuts, fresh dill and fresh oregano and it’s simply assembly time. Add the beans, walnuts & cumin to the mushrooms, stir well, check for seasonings. Then add a dollop of tahini yogurt and sprinkle with fresh herbs. A welcome addition to summer picnics or a park bench lunch. Fava beans are my favorite beans, hands down. 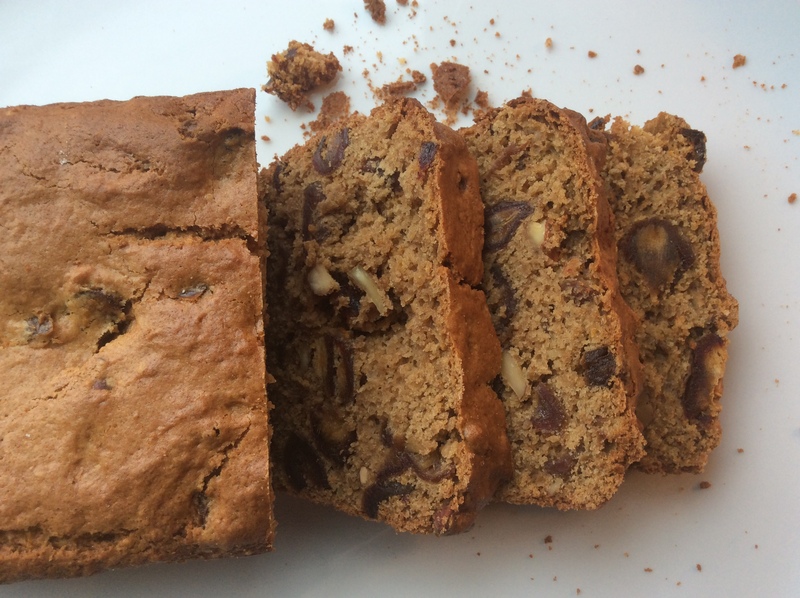 They have a short spring season and take a few minutes of extra work to make ready, but there is nothing better than their nutty, sweet, earthy flavor. I’ve always enjoyed them simply handled: quickly boiled for a minute or two, skinned, with a touch of butter and salt, but then I came across a Yotam Ottolenghi recipe for Fava Bean Burgers…Fava beans pods are roughly six inches long and once you snap them open, you will find three to five fava beans in a soft, furry lining. Apparently you can boil the beans and eat as is, but each bean does have an additional protective sheath, and I prefer skinning them after boiling (as is also called for in this particular recipe). Recipe calls for mashing these bright green beauties with cumin, coriander, fennel, spinach, jalapeño, boiled potatoes, garlic, cilantro, breadcrumbs, egg (are you excited yet?). Finally, a quick sear in a hot pan with safflower oil, and you’ve got a powerhouse lunch, smooth and nutty from the beans, a little crunchy with the seared potatoes, and bursting with spice from the cumin, coriander and fennel. 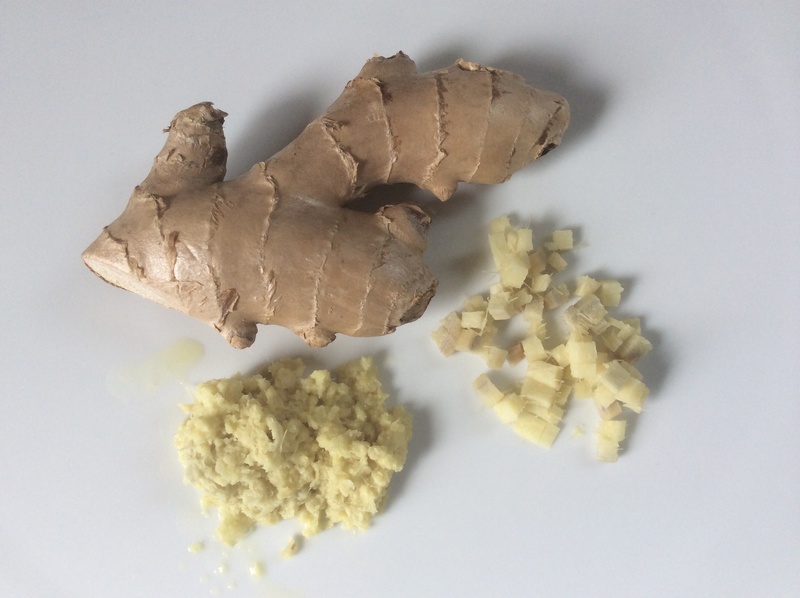 Ginger root is a wily superhero. Knobby ends with smooth tan skin, it appears quite unassuming until you slice away a corner and are overcome with its impressive fragrance, sweet and strong and medicinal. Nearly every cuisine uses it in some form: fresh, powdered, pickled, candied, juiced or steeped. I often buy the root to freshly grate into stir-fry or noodles dishes, or to use in cookies and cakes, as done here. 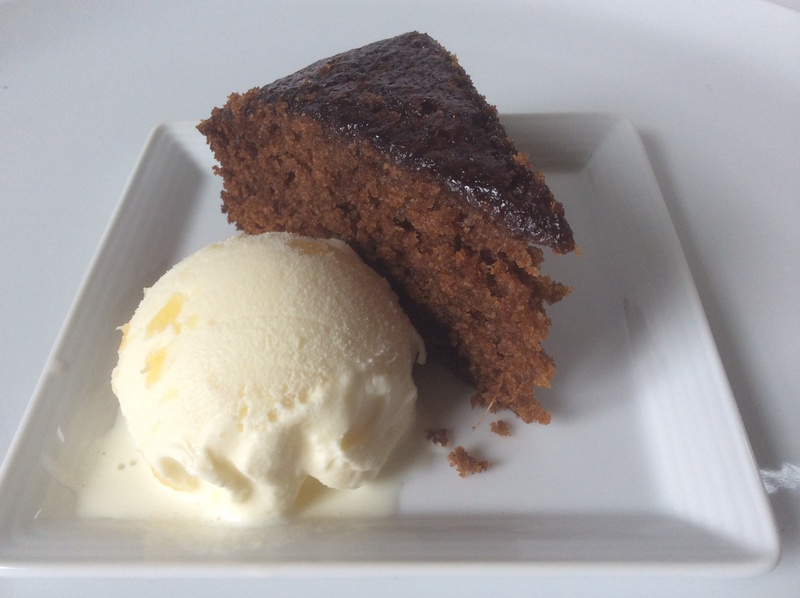 This is a David Lebovitz recipe for Fresh Ginger Cake, made with molasses, cinnamon, cloves, and lots of freshly grated ginger and baked in a springform pan. 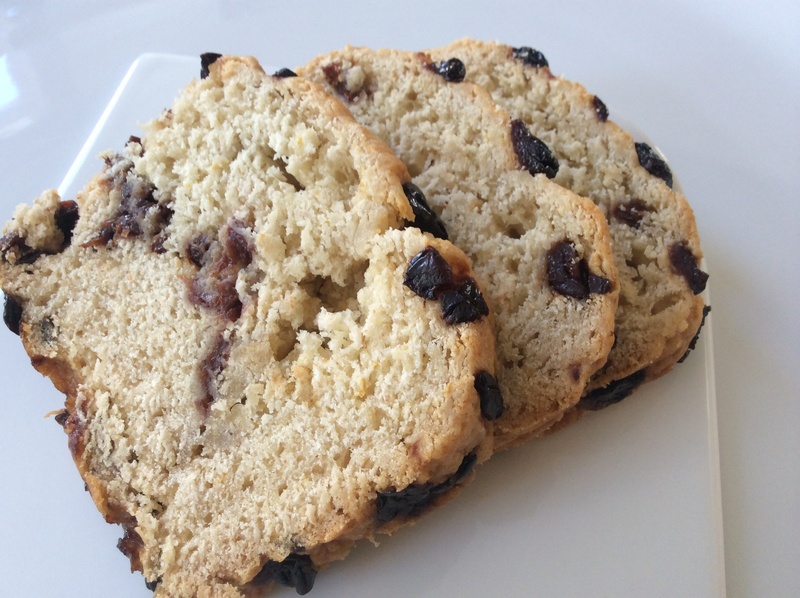 It is a lovely, light dessert alternative to chocolate or lemon, and works year round. Accompaniments could be sweet whipped cream, or rhubarb compote, or in this case, pineapple coconut ice cream. Enjoy! 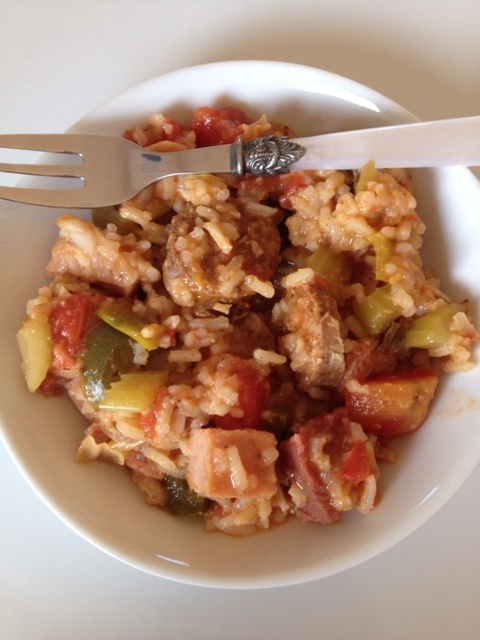 Something about Mardi Gras – or the fact that I received an enormous ham steak in my meat CSA – and I had jambalaya on my brain this week. A little New Orleans trinity of onions, celery and green peppers sauteeing on the stove, and I was on my way to making a big batch. Add to the trinity: your favorite cajun seasoning (usually a concoction of paprika, salt, garlic, sugar, oregano, cayenne and thyme), some diced tomatoes, rice, stock and cook away for about 15 minutes (or until rice is tender); finish with a little chopped ham, spicy sausage, and shrimp, if you’ve got ’em, and you’re in business! 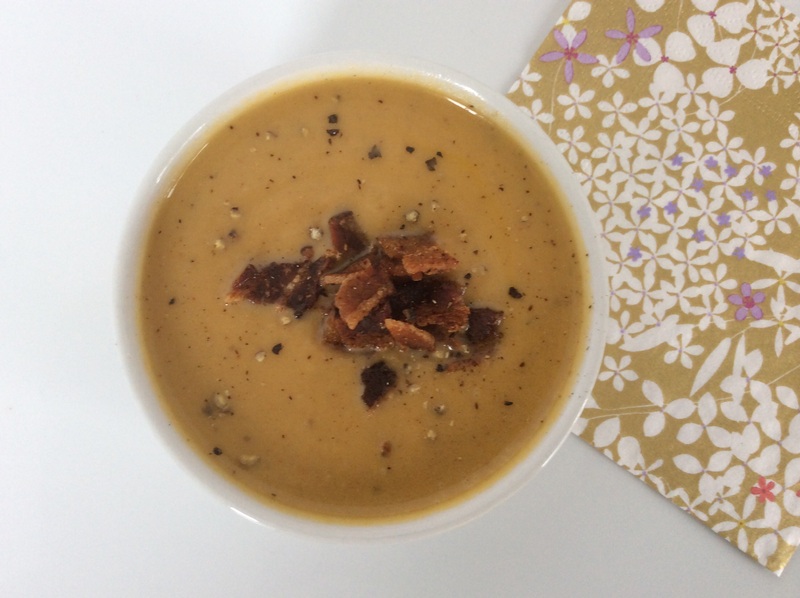 As we are perhaps nearing the final cold days of winter, it was actually quite exciting to stumble upon a recipe that could still make squash feel new & fresh. Leave it to Mr Ottolenghi again. So simple and yet so interesting: roasting the squash and onions until they are browned actually brings the sweetness to the table, and then adding tahini (sesame paste) mixed with lemon and garlic, and sprinkling with za’atar makes for a simply wonderful mix of textures and flavors. It’s warm and familiar, and yet also, spicy and fresh. An gentle awakening for the senses…just in time for Spring…which must eventually arrive, right? 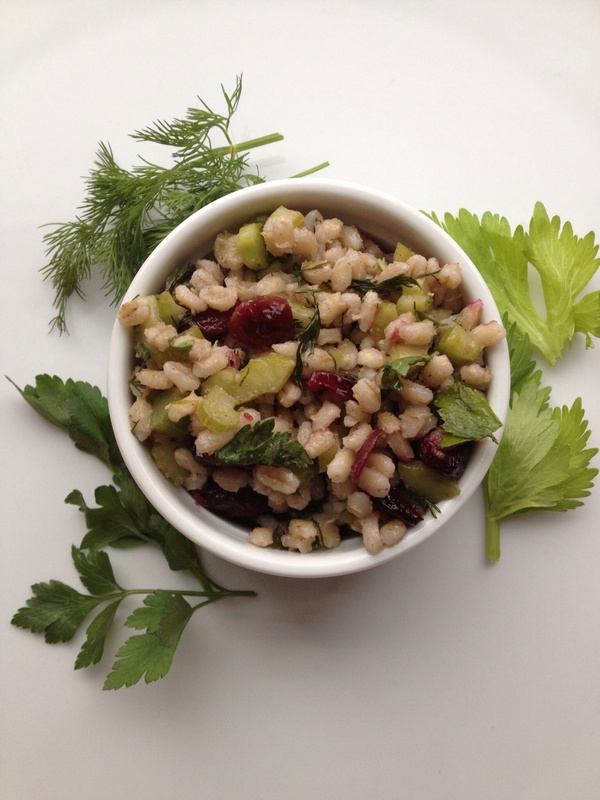 A really nice winter pick-me-up kind of dish here: the barley offers a heartiness, the crunchy celery folded in adds a bite, dill & parsley keep it interesting, and little surprises like allspice and sherry vinegar keep it very bright and playful. The original recipe, from Yotam Ottolenghi’s Plenty, called for pomegranate seeds, but I just missed the last batch of them at the market, so I substituted dried cranberries. A feel-good bowl of goodness for you! 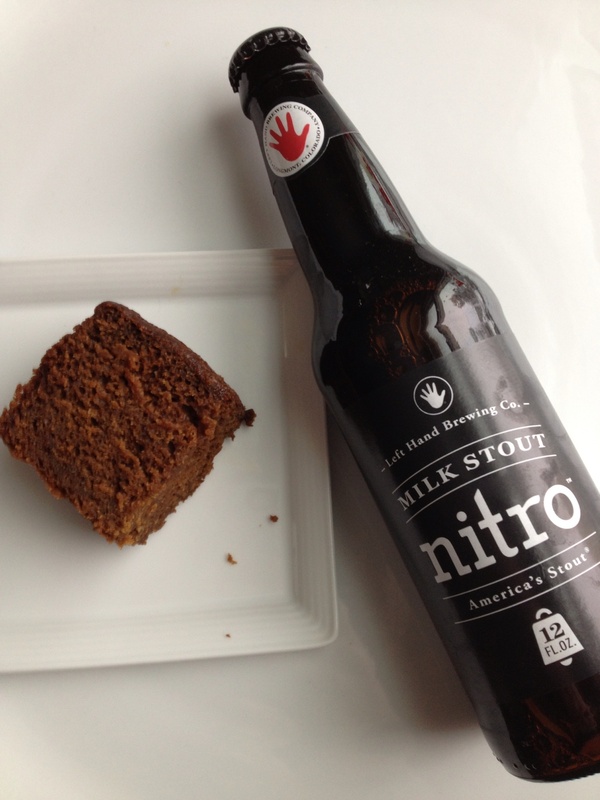 I happily bake gingerbread or ginger cakes all year long, but adding a heady stout to the mix feels like a December kind of thing to do. So after reading a reference to an Irish blog post about an Irish stout gingerbread, I swapped in American made Left Hand Brewery Milk Stout and the results were as you would expect: dark, sweet & delicious. Adding a scoop of vanilla ice cream (ok, or brown-sugar chocolate chunk ice cream) highlights the stout-ginger marriage. May I bake it for you as part of your in-home services? Happily! Please check out my in-home link above. Happy Holidays! Heavenly. And Nevisians are always so warm and welcoming. Such a gift to visit.